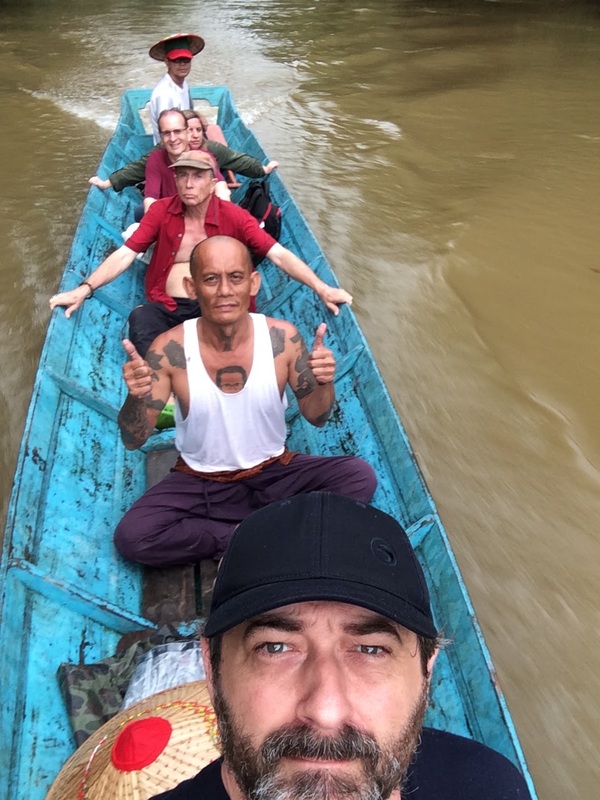 Richard Cloue, Peter John Jaban, Michel Viet, Robert Raymer, Laure Michel, and Bidayuh boat owner! While filming the departure and arrival of Peter and the Bidayuh on the longboat, Michel used his drone for the full river shots. 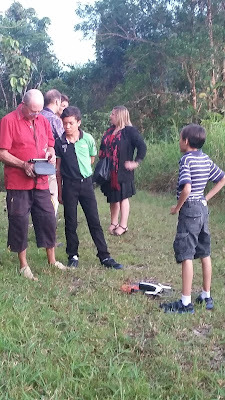 Michel also had the drone follow the longboat down river. Our view was obscured by an overhanging tree. Then disaster struck. The drone, accord­ing to Peter, had collided into an overhanging branch on the opposite side of the river, and dropped. 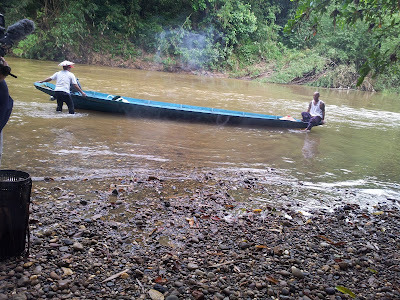 Peter had ex­pected it to float on the river and was waiting to capture it, but instead, it sank. The river was too deep and too muddy to see. The Bidayuh cast his fishing net several times but failed to catch it. Meanwhile, Michel, in panic mode, handed me his glasses and shirt and went into the river to see if he could retrieve it himself. Although understandable, I thought it was a really bad idea….This is where serious accidents happen; the river’s current was swift from the recent rain and Michel was not young at age 68. Luckily for Michel, Peter and the Bidayuh made sure nothing un­toward happened. Eventually, all three of them returned to us, though saddened by the loss. Not only was the top-end drone gone (that cost 700 Euros), they lost all that great footage on the river. When I handed Michel his shirt and glasses, he looked at me with startled surprise. As we were about to leave for Kampung Git, there was some concern that there were too many of us to ride safely in the longboat—although long it can be quite unsteady getting in and out. Again, I felt like an extra tire that wasn’t supposed to be there. Once the six of us settled in with all the gear, with Richard at the helm so he could get in some river shots, we were fine. Get­ting out though was another matter; when Michel got out, the longboat rocked and I, in the midst of getting up, landed on my back. I was just glad I didn’t end up in the river. With the light fading and time running out, since they were scheduled for the pepper farm shooting the next few days, this was their last chance to finish the Maugham shoot, so Richard had me sit on some boulders, with the river and the longboat as a backdrop. I talked about the characters in some of Maugham’s stories, who came out here between the wars, adapt­ing to life on the lonely outposts alongside Borneo rivers, sur­rounded by jungle, feeling at times euphoric, like a king among his far-reaching district, his domain, not seeing another Wes­tern­er for months at a time. For some, this was the life; for others, they buried their loneli­ness, their misery, and their unsuitability for the task (even their incompetence) by getting drunk. As an expat, having spent half of my life in Malaysia, I could relate. Maugham also wrote in one of his later novels, “I want to see life and death, and the pas­sions, the virtues and vices, of men face to face, uncovered.” Here in Maugham country, he found it and exposed it in his short stories. Richard told me there was no more light to film, but I was on a roll and wanted to keep talking, to finish answering the questions that Laure had showed me earlier. I suggested that, al­though they couldn’t see me, they could continue filming for the dialogue, which they could then use as voice over for earlier shots of me walking here and there in the jungle. Laure agreed so I con­tinued to talk in the fading light. I became this silhouette against the river and the jungle amid this amaz­ing afterglow of red. I also felt what those lonely district officers must have felt when they wit­nessed the same beautiful sunset. “Did Michel cry?” Justin asked me. I said, “No,” but I told them about his gallant effort to save his missing drone at great per­sonal risk to himself. I had suggested to Karen that perhaps she could borrow or rent a drone for the pepper shots. She knew some people who had drones, and was able to borrow one, so the filming con­tinued on schedule….On Thursday evening, after the pepper story was complete, Laure asked me to join them for drinks at Grand Margherita and seafood at Top Spot. It was fun see­ing them again and hearing about the rest of the shoot. But now it was time to say goodby, at least for now, to Somerset Maugham. Although I was not paid for my part in the filming and went into it fully understanding that, (though hoping some money might materialize), I was rewarded many times over by renewing some friendships, for the excitement the filming brought to my children (especially seeing a drone up close and in operation), for the op­portunity to go upriver on a longboat (thanks, Karen!) and watching Peter cook this marvelous dinner in bamboo on a tiny pebbled beach at the edge of river. For me, being able to break out of my routine, to take step back from writing in isolation and realizing there’s a big world out there in my own backyard—Borneo—felt awfully good. Instead I thought of that sunset, the vivid color of red glowing in the jungle. For me, that was the perfect ending for a magical two days of filming that literally came out of the blue.